Posted on December 1, 2014 by No Map Required Posted in Costa Rica, Places	. Drake Bay from the road up to our hotel – pretty nice, eh? Drake Bay…you were an interesting stop. There was a lot of hype, probably too much to live up to…plus I am a spoiled snorkeling snob and there is not much we can do about that. Let me tell you a little about the area, though. Drake Bay is really secluded. Up until a few years ago they didn’t have electricity or <GASP> the Internet! 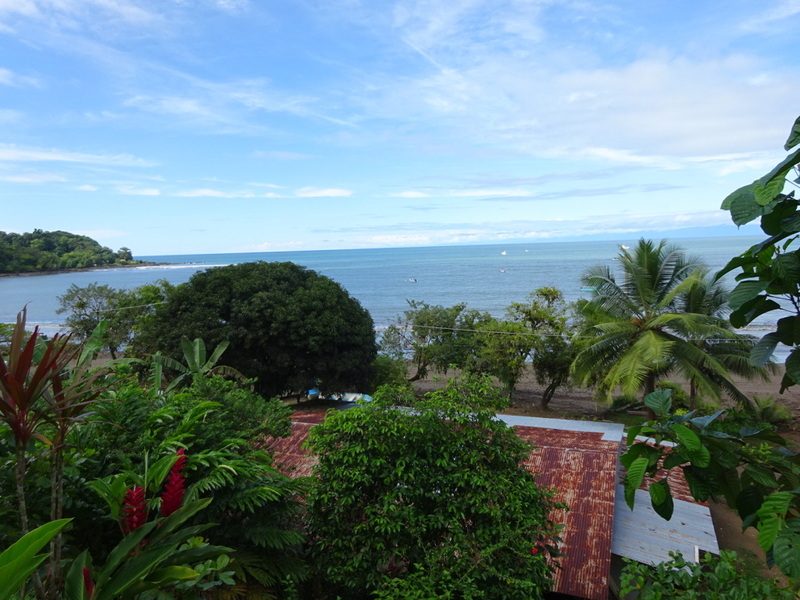 It is basically a tiny little village near Corcovado National Park (technically there are a couple tiny spots, but we only visited one). Everything we read boasted about the best national park in Costa Rica with the most bio diversity…even by CR standards: turtles hatching, monkeys, macaws, toucans, and the best snorkeling around. We knew we HAD to go. What we didn’t read was just how pricy everything was. Sure there was loads to do and not a lot of people – which is super awesome – but we decided we couldn’t afford the entrance fee for most of the activities (typically in the $75+ per person range). 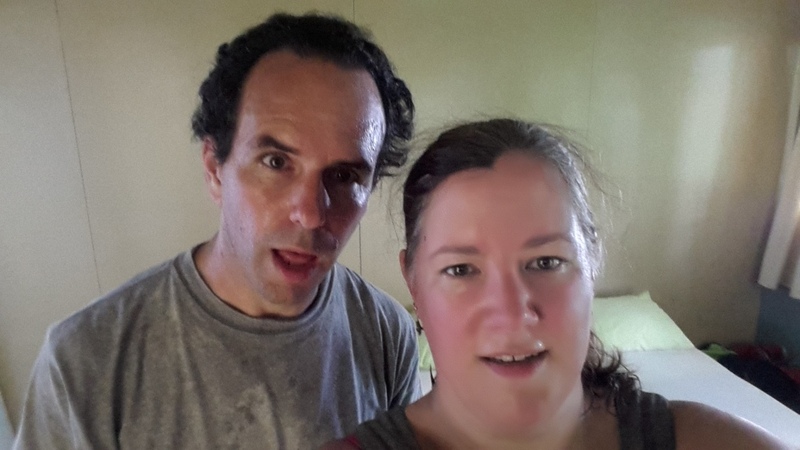 Perhaps we could have gone with slighly cheaper non-A/C accomodations for an extra trip, and you can go ahead and judge us, but with 90+ degree days and four million percent humidity, we weren’t ashamed of seeking afternoon refuge in the A/C! I have never sweated so much in my life by just walking. Not even fast walking…just breathing, really. We settled on a day of snorkeling and a night hike with the self proclaimed “Bug Lady”. 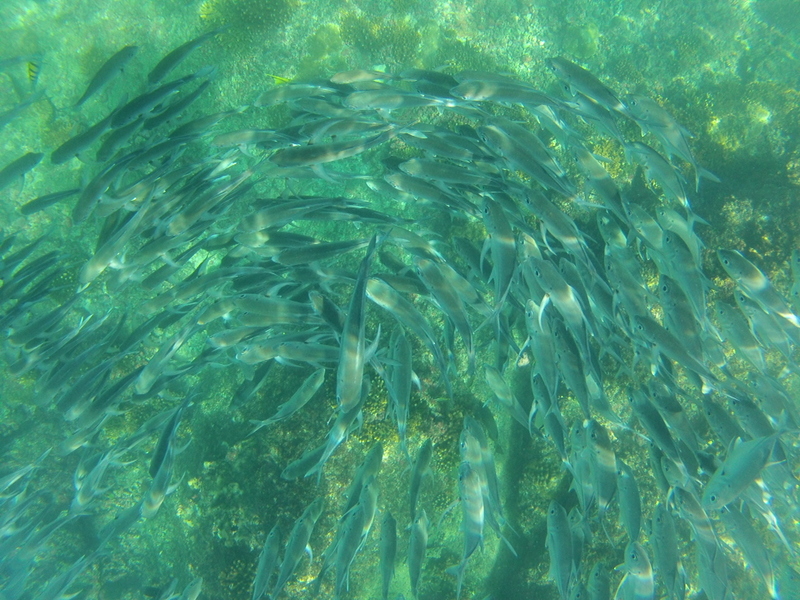 I was skeptical of the snorkeling, but after the two day bus commute to Drake Bay, we were going! Turns out my skepticism was right on. The visibility was low, but it didn’t matter because there wasn’t really that much to see. One half-second shark sighting and one school of Big Eye Jacks (which really were cool) were about all we got. Even Aaron knew that was kind of lame. Nice, though, to be on the water all day, get a little sunburned and feel like at least we left the safe confines of the A/C to see what was out there. We are pretty sure it just wasn’t a great day for snorkeling…way too many people have raved about it and we have seen pictures that others have taken so we just ended up with a touch of bad luck. 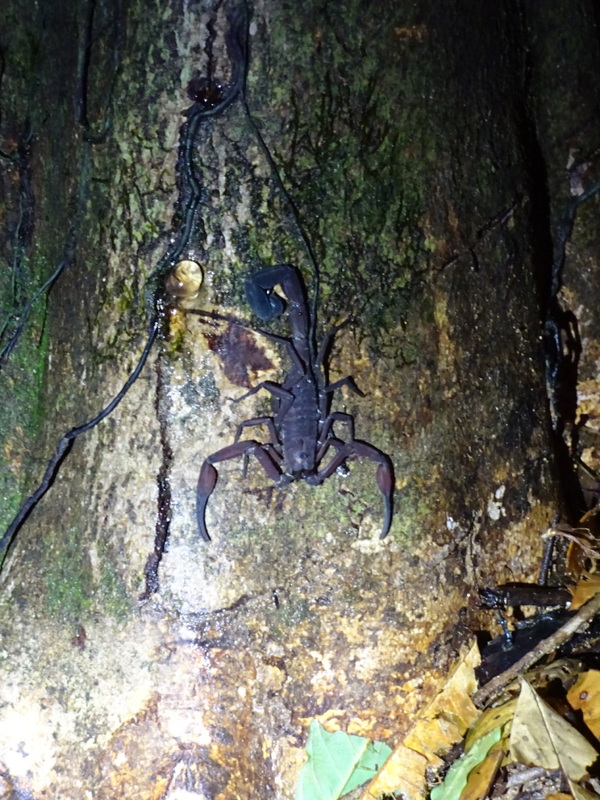 Then there was the Bug Tour – a pretty cool night hike with two guides. The frog guy met us at a cafe and then moments later was telling us about the life cycle of this particular frog he was pointing his light at. The way the Bug Tour works is we walk on a little path (that Aaron and I had walked by day, which was nice) while the guy searches out frogs, toads and mammals and the lady, Tracie, looks for spiders and other insects. Over the course of a couple of hours we saw oodles of spiders (including trap-door spiders: cool to see their little traps), ants, a snake, scorpions, a tarantula, Tailess Whip Scorpions that aren’t actually scorpions, and all sorts of frogs and toads. 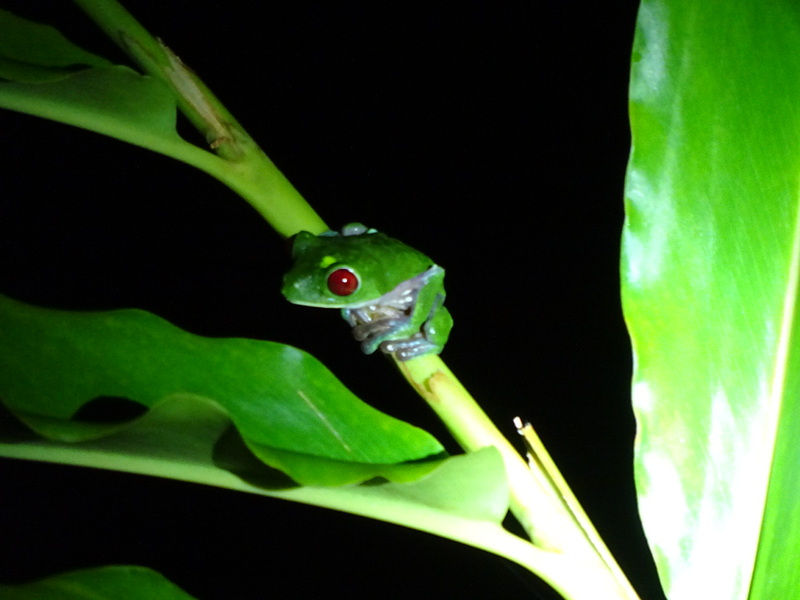 It was an excellent complement to the mammal and bird filled night tour we had done in Monteverde. Frog on the Bug Tour – apparently the most photographed type of frog in the world! I liked the guy a lot more than the woman. Aaron immediatly noted that the guy spoke in an engineer’s monotone and just listed the frog facts. I loved each and every story of frog life-cycle, jaw dropped and spell-bound. Aaron, not so much. The Bug Lady was a bit dramatic with long, pensive pauses and, in my opinion, quite erroneously compared a certain type of ant hive to a wolf pack. Having learned a lot about wolves from a National Geographic researcher, we know just how amazing wolves are and we did not begin to grasp the comparions. I did all I could to not yell out something like, “you’re full of it!” thinking that does not make for a good Ambassador of the US – which Papa Barr reminds me I am. Aaron then used his jeweler’s eye to continuing pointing out more spiders that not even the guides were pointing out. He seemed to like the thrill of finding them – that was kind of fun too. A real life scorpion on the Bug Tour. A few of the highlights were happily free. Before we even arrived in our room we saw a toucan eating! He was HUGE. They are shy, so it was awesome to see it out in the open. Then we saw a tree full of macaws. They are much bigger than you’d think and there was a flock of six that we heard every morning and then could watch fly in pairs formation high above the trees during the afternoon. Every bit as cool as the Blue Angels and just as loud – man do they make a grating call. Still, they gave me a little chill everytime I saw them. We did a couple of different free hikes – just walking along the roads and along this path that goes for miles beside the beach/rock coast line (part of which was the Bug Tour locale). Spectacular, but HOT! 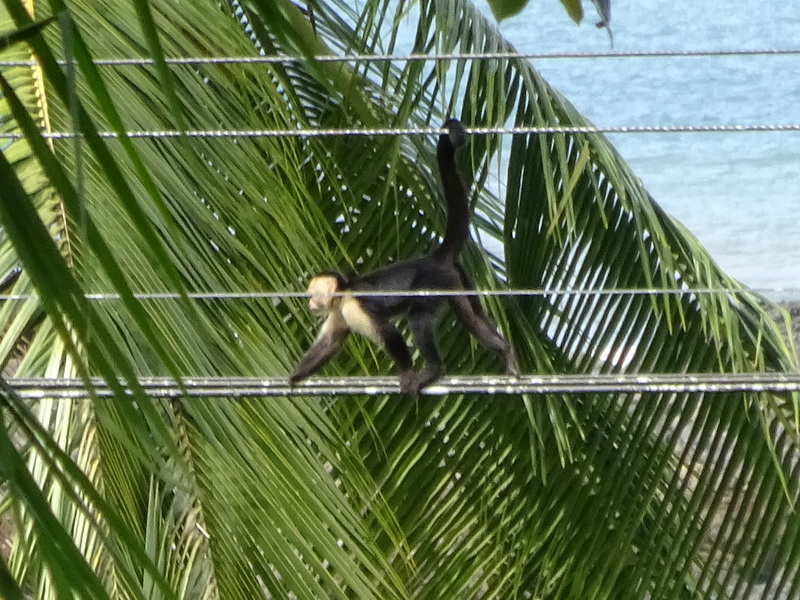 There were loads of monkeys racing around in the trees. One of the biggest rainfalls of the year happened while we were there…an entire afternoon and night of absolute Noah’s Ark type deluge! You couldn’t see a few trees in front of you. It sounded awesome on the tin roof. During a lighter rain we saw a familiar form walking down the one and only road and again I sprung up and ran out to yell, “Matthew!” Our friend from the UK who we had met a few towns earlier, was there too. 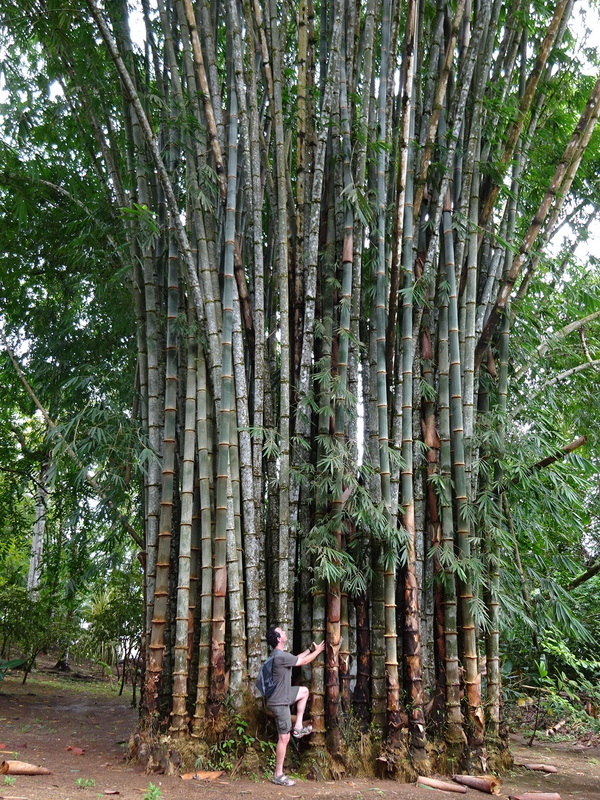 Now this is what we call some bamboo! It was Thanksgiving afternoon and Matthew was starving – having traveled for the past day he hadn’t had a proper meal. We had already tried a couple of places and we asked him to join us a Gringo Curt’s immediately across the dirt road from where we were standing. Gringo Curt is originally from Ohio and came to Drake Bay five years ago to do some volunteer work. Since then he has been adopted by the community and has set up his own little restaraunt that only serves 3 dishes….same dishes every single night for five years. He buys whatever fish is fresh caught that morning (wahoo, tuna and mahi-mahi while we were there) and cooks it up in a banana leaf served with with some different sides. The portions are huge and two entrees was plenty for three people. Not only was the company fantastic, the food was superb…hands down the best we have had in Costa Rica. 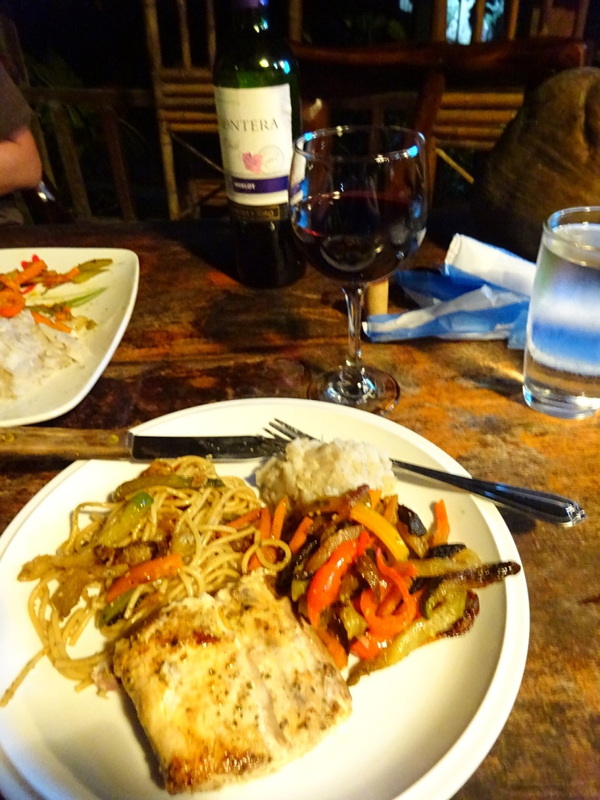 As an added bonus it was also one of the least expensive meals of the trip…and by far the cheapest we had in Drake Bay. We also met Patrick and Jens; two guys from our hometown of Seattle who were in the tech industry but got burned-out and headed to Drake Bay to set-up Dake Bay Cafe and a hotel just steps from the house Jens grew up in. They were incredibly nice and welcoming. The coffee was great. They made a crazy little banana bread that was banana, chocolate, nuts, coconut and…chocolate butter cream frosting. All served cold. It was a wacky little concotion but delicious. One thing Aaron and I agree competely on is that we loved our adventure just getting to Drake Bay. That alone made it worth it – it felt like a real journey and not a vacation. I think if we were vacationing at Drake we would have opened up our wallets, done a bunch of activities and come home raving about it. Instead, we think we were lucky to go on a couple of tours, meet interesting people, try some fabulous food, have a few nice boat rides and relax for a few days in the most chill, laid-back place we have been to yet…without a trinket shop to be seen. I love Corcovado NP. Full of critters and streams. Frogs were my favorite. Hope you got to see a poison dart frog. They are so colorful! Glad you got a chance to snorkel. The ex-pat fooderies sound wonderful. And chocolate banana bread – what’s not to like. I am loving these posts! Getting so many ideas on where I want to travel next! Thanks! Keep us posted on your adventures, too. We are always on the look out for new places to add to the itinerary!